The first caravan of Central American migrants reached the town of Matías Romero in Oaxaca state on November 1, 2018. The Mexican Secretary of Foreign Affairs estimates that 4,000 people spent the night there. 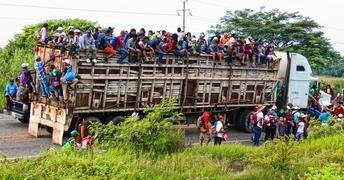 Protection officer Martiza Matarrita said that many migrants had learned about the caravans via social media and television reports and had not understood what was involved in the trek to the US border. The UN agency – which said that 62 per cent of those who joined the caravans did so to search for work - also cited the testimony of Dennis Javier, one of the migrants who requested IOM’s support to go home. More than 450 migrants have been helped back to their countries of origin since 4 November via IOM’s Assisted Voluntary Return programme, which is funded by the US State Department’s Bureau for Population, Refugees and Migration. According to the UN agency, more than eight in 10 returnees were men and nearly one in three were aged 19-25. Nearly six in 10 people of those who joined the caravans came from Honduras, almost four in 10 were from El Salvador and around one in 20 were from Guatemala. An additional 25 unaccompanied migrant children were helped home by plane, IOM said, adding that in the Mexican city of Tijuana - close to the US border - more than 300 people have also sought the agency’s help to go home. In addition to its facilities in Tijuana, IOM also runs information and registration booths in Tapachula, Mexico City, and in Tecun Uman, Guatemala. To ensure the safe return of the migrants, IOM coordinates with the governments of the returnees, who receive food and psychosocial support at border crossings. When they arrive at reception centres in El Salvador, Honduras and Guatemala, migrants receive hygiene kits and, in many cases, transportation money to get home. According to IOM, although “a large number” of migrants who had joined the caravans had “muscle disorders, fatigue and malaise…cough and flu”, more than four out of five were in “healthy” shape. Since 1979, IOM has helped 1.5 million migrants return to their country of origin or residence through its assisted returns scheme. "A voluntary returns programme is an indispensable part of a comprehensive approach to migration management aiming at orderly and humane return and reintegration of migrants who are unable or unwilling to remain in host or transit countries and wish to return voluntarily to their countries of origin," said Marcelo Pisani, IOM Regional Director for Central America, North America, and the Caribbean.